Waking up to a -24° Fahrenheit temperature (-46° windchill) yesterday, I was not looking forward to what the day had in store. Here is what the kitchen window looks like. 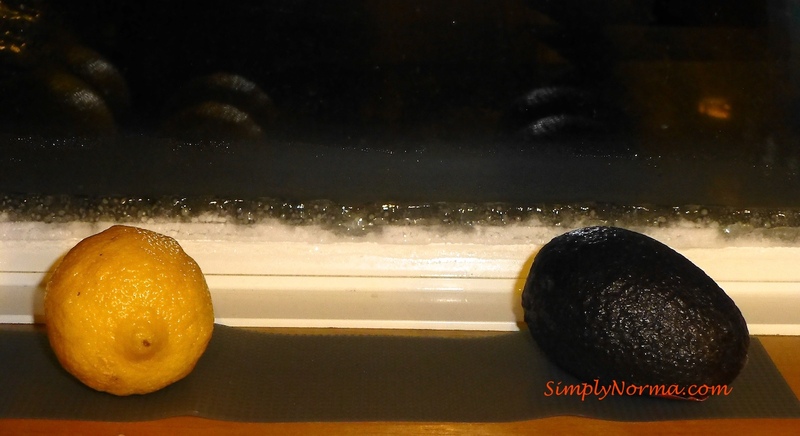 We don’t have to put our vegetables in the refrigerator as the window sill keeps them cool enough. In spite of the cold, I was pleasantly surprised that I was able to accomplish quite a bit and also try a new recipe. It was just “one of those days” when everything went right. I paid my bills and a friend’s bills, sent out January birthday cards, organized files for the new year, prepared my quilting blocks for more sewing then cooked a new recipe. In the middle of all that, I headed outdoors when the temperature was a -16° to put the mail in the mailbox for pickup. Later, when it was a balmy -12°, I went outside to retrieve the delivered mail. Brrrr. I should have worn my long johns. Feeling a sense of accomplishment, I went to the kitchen and gathered the ingredients for the new recipe I wanted to try. Hmmm … after reading through the recipe, I decided I was going to improvise on the instructions and ingredients — and so I did. 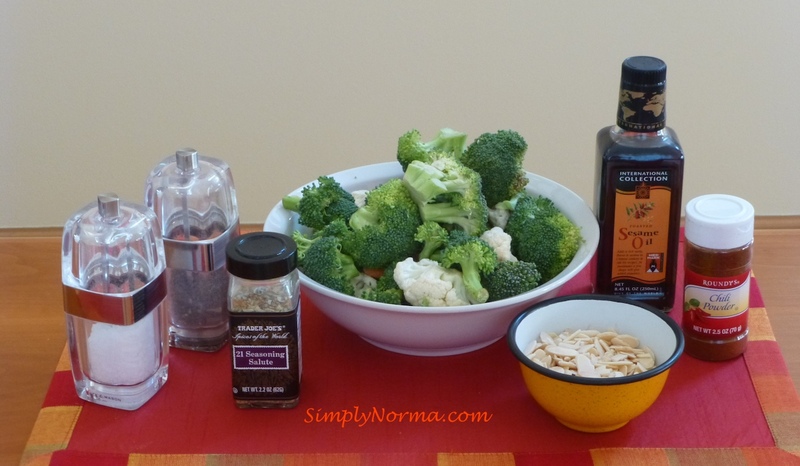 The original recipe is a Broccoli, Chicken and Almond Saute but I used a vegetable mix instead of just broccoli along with a few other changes. So — here is what I did. And — you will enjoy this one. It’s easy and quite tasty. While the chicken is browning, you’ll toss your vegetables in a skillet to start their cooking process along with a splash of sesame oil. 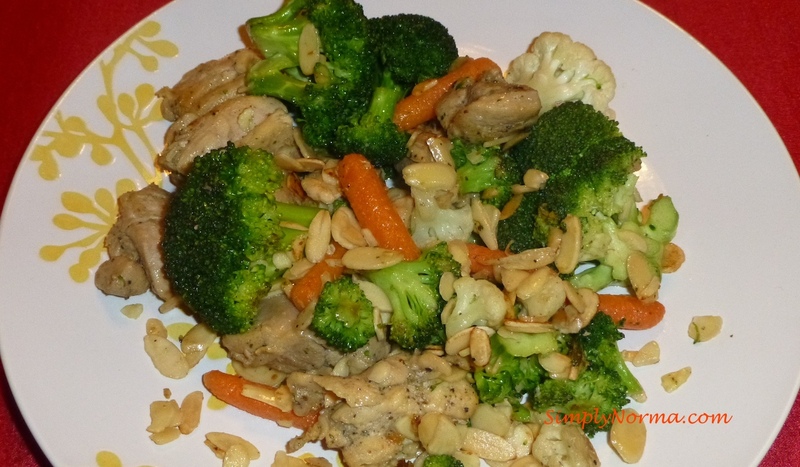 After the vegetables are about halfway cooked, add the chicken and toss everything together. Allow everything to cook through. Ready to try it? Remember you’ll be using two skillets side by side. Add the spice rub (or spices of your choice) in a large bowl along with some salt and pepper. Add the chicken pieces to the spice rub and toss to coat. Heat an iron cast skillet on medium and add a tablespoon or two of olive oil. 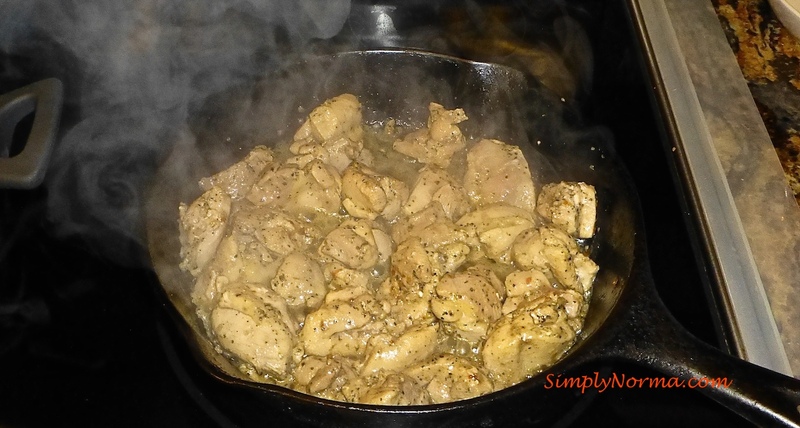 Toss the chicken into the skillet and allow the chicken to brown on both sides. On the other skillet, add a tablespoon or two of olive oil along with the chili powder and set the heat on medium low. 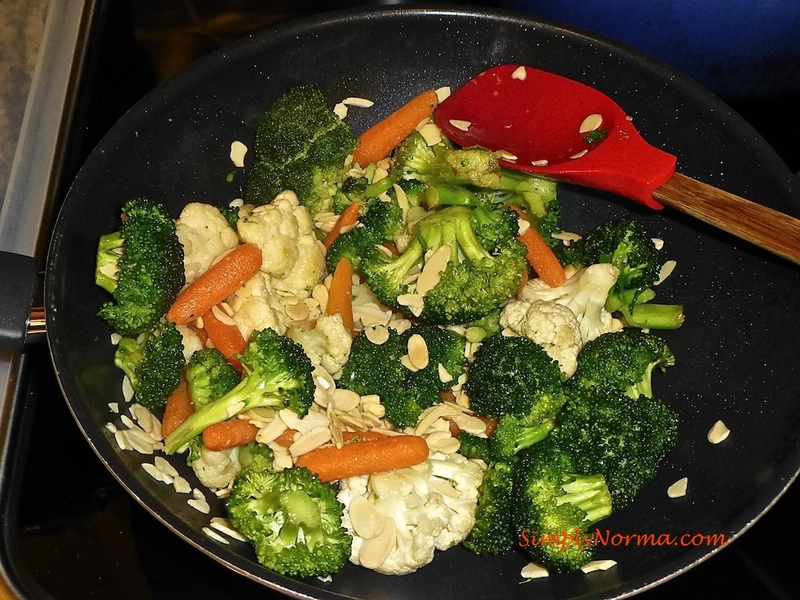 Once the skillet is hot, add your vegetable pieces to this second skillet and toss with the olive oil. Once the chicken is browned on both sides, remove it from the heat and set it aside until the vegetables are starting to soften. 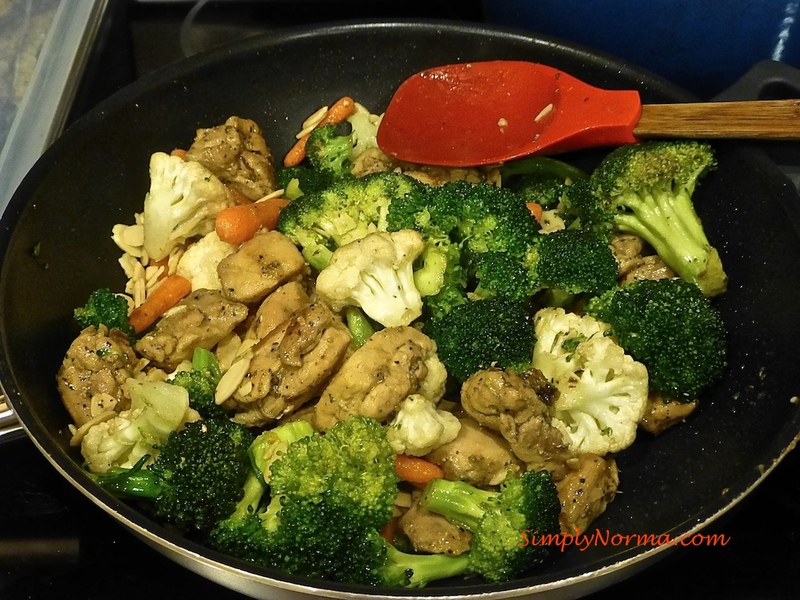 Add the chicken to the vegetable mix and toss together. 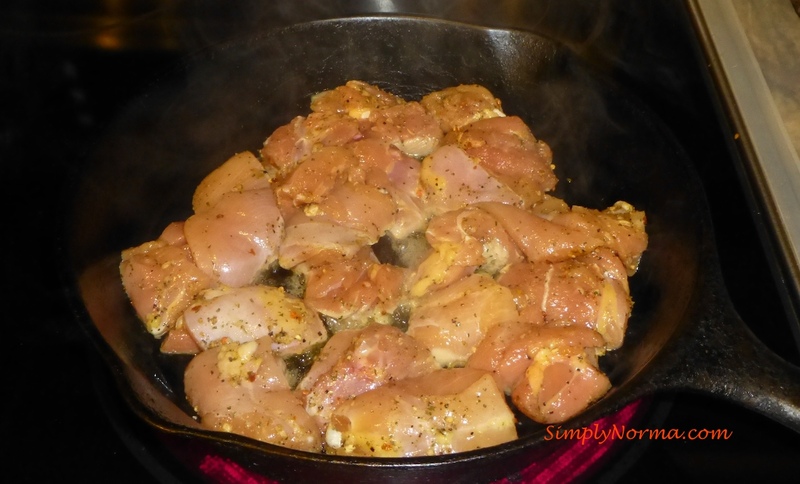 Taste one of the chicken pieces to make sure it is thoroughly cooked through. Add the almonds and toss everything together again. That’s pretty much it. It’s quick, easy and a great comfort food for any day of the week. And, I thoroughly enjoy my Trader Joe’s 21 Seasoning Salute. It has a tad of cayenne pepper — small enough for me to enjoy and strong enough to give the chicken a flavor boost the way my husband likes it. All of you who are in the midst of this polar vortex — STAY WARM!! !